If there is an iconic image of Russian imperial power and looking westward toward Europe, it is this enormous statue of Peter the Great, funded by his successor Catherine the Great, in Saint Petersburg. 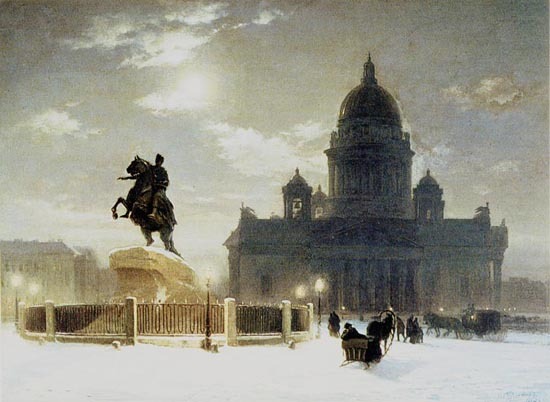 Known as the Bronze Horseman, it famously was celebrated in a hallucinatory Pushkin poem of 1833 and in this painting from 1870 by Vasily Ivanovich Surikov, which shows St. Isaac's Church in the background on a moonlit wintry night. The statue - like city in which it stands - has provoked all sorts of ambivalence in Russian artists. Pushkin's poem set the tone: its poor hero is driven mad by the floods that menace the city, so he curses the statue, which comes to life and chases him down. Soon afterwards he is dead. Such a pessimistic and ambiguous message would not have been what Peter and Catherine had in mind. Propaganda can be reversed. 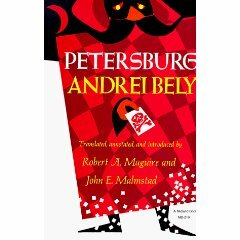 The famous horse pops up again in the much respected Symbolist novel Petersburg by Andrei Bely. This book's poor hero is caught up in the Russian Revolution of 1905 and assigned to assassinate a reactionary government official - his own father - and he too is pursued by the famous bronze statue. The novel is a difficult read and has been compared with Joyce's Ulysses. Finished in 1913, it was revised and published in Berlin in 1922. Nabokov admired it.